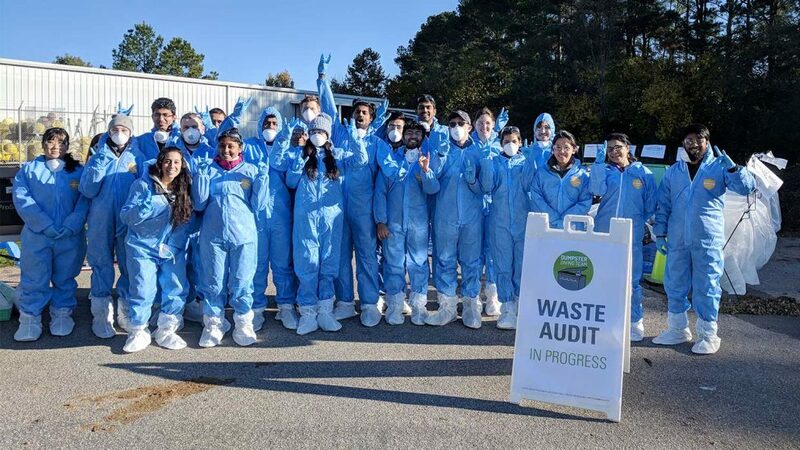 Through a waste audit, the students discovered that half of building’s waste could be diverted from the landfill through composting or recycling. As a result, new initiatives are being explored such as paper towel composting in bathrooms. About 30 students and a major campus building are more equipped than ever for a sustainable future. That’s thanks to an NC State course called LEED Lab, which brings together future engineers, architects and environmental scientists for a hands-on experience as sustainability consultants. “This class was not just an exercise to get a grade. This is a contribution to a facility at the university,” said Director of Continuing and Professional Education Chip Futrell, whose responsibilities include the McKimmon Conference and Training Center. 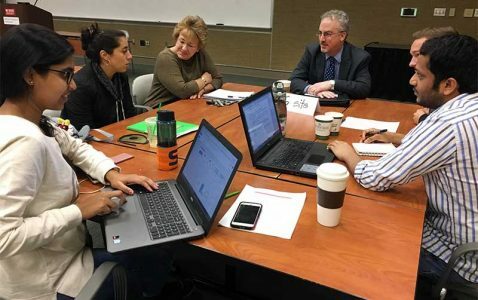 When LEED Lab co-instructors Liz Bowen and Traci Rose Rider approached McKimmon Center leadership about being the focus building for the course, Futrell and others welcomed the infusion of student ideas. Opened in 1976, the McKimmon Conference and Training Center is the headquarters of the university’s robust continuing education program that serves the entire state of North Carolina. The building has more than 100,000 square feet and hosts about 200,000 visitors annually for a variety of meetings, conferences and training events. Students learned to measure indoor air quality, analyze energy and water use, calculate payback periods on efficiency improvements and weigh tradeoffs. Save a bit of energy here, and it may increase costs elsewhere. Improve the environmental impacts in one area, and it may cause unintended consequences elsewhere. “There are so many synergies and tradeoffs. If we’re doing a lot of good, there are always tradeoffs,” said architecture student Nick Lash. On the last day of class, students presented their sustainability recommendations, which ranged from harvesting rainwater and installing new lighting to calibrating air handlers to optimize energy savings. “The most rewarding part is to see students move from the position of student to the position as consultant and expert,” said Liz Bowen, a strategy consultant with FMI Corporation and course co-instructor. Students in the LEED Lab course represented four of the university’s academic colleges. On the final day of class, they presented their recommendations to McKimmon Center leaders. The is the fourth time the LEED Lab course ‒ hosted by the College of Design’s School of Architecture in partnership with the University Sustainability Office ‒ has been offered on campus. Since the course began in 2013, nearly 100 students have evaluated sustainability in Nelson Hall, Bragaw Hall, Talley Student Union and McKimmon Center. Though the buildings change, the interdisciplinary nature of the course is constant. “What we are really interested in is providing this kind of interdisciplinary work that students don’t often get in classes,” said Traci Rose Rider, a College of Design research associate and course co-instructor. The opportunity to work side-by-side with students from other majors was one of the reasons Prajakta Akhare participated in the course. Through the course, the students earn documented project experience required to take the LEED Accredited Professional certification exam. This resume-building opportunity gives students an edge as they begin their careers, Rider said. The course also leaves lasting benefits on campus. With a list of recommendations from students, McKimmon Center leadership now has a roadmap for boosting sustainability in the building. Published in Buildings, News, Newswire, Students.